Former world heavyweight champion Tyson Fury wants US President Donald Trump in his corner as he mulls “the biggest fight ever” against reigning IBF and WBA champion Anthony Joshua, AFP reports. Joshua, 28, successfully defended his titles against Carlos Takam in Cardiff on Saturday and either WBO champion Joseph Parker or WBC champion Deontay Wilder appear the most likely next opponents. 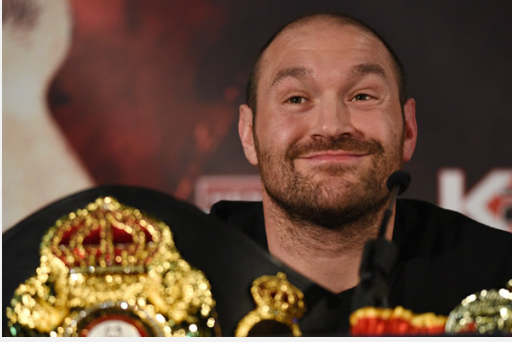 But Joshua’s promoter Eddie Hearn is also eyeing an all-British showdown with Fury next year. Fury, 29, this week contacted Trump on Twitter to ask him to join his ringwalk, asking the US president who he thinks would win a bout with Joshua. “@realDonaldTrump who do you think wins the fury vs AJ fight? You can walk me out if you want, be a part of the biggest fight ever,” he tweeted. But he believes a bout with Joshua would resemble Muhammad Ali’s legendary “Rumble in the Jungle” with George Foreman in Kinshasa in 1974. Fury posted an image of the two all-time great combatants on Instagram, along with the caption: “This is what’s to come! “The old champ coming back to fight a man who every1 thinks will ko me, same as Ali vs Forman the stylish Ali vs the mummy Forman! We all know what happens in this fight! Fury, who is still waiting for a final ruling from UK Anti-Doping on a suspended drugs ban after the hearing was adjourned in July, also laid down the gauntlet to Wilder. “AJ & Wilder I’m coming back for you pair my mission is seek & destroy the only thing on my mind is destruction who ever gets in my way will be dealt with accordingly.